Go to Page 62-63 on this link. Bob Tuner didn´t get into the bird business to make it rich. He´s in it for pure love. In fact, the father of four is a career carpenter and contractor. "Never in my wildest imagination did I think I´d end up owning a bird shop," Turner, 60, said. "It´s been a good change. I love people. I love coming in and seeing the new baby birds each day." It was a series of unusual circumstances that led to the opening of Brenda´s Birds at 324 N.E. Third Ave. 10 years ago. "We owned the building. It was two apartments in the back and a warehouse in front. The tenants were never paying rent and were even stealing from us," said Turner, who came to Delray Beach in 1969 with Rosemary, his wife of 43 years. " I kicked them out then told my oldest daughter, Brenda, that we were going to open a business, whatever she wanted. I was ready to retire from the carpentry business anyway." And birds had always been a love of Turner´s. "When I was a little boy I once rescued a wild sparrow. I nursed it back to health then set it free," said the New Jersey native. "For one year the bird always flee back and sat on my shoulder." That love continued through his grown-up years. "When I was younger he sent away for quail eggs, hatched it and from there we ended up eventually having more than 300 birds in our backyard," said Michelle Briganti, Turner´s daughter and co-worker. "It was his hobby." It was no surprise to the rest of his family when Turner and his eldest daughter decided to open a bird shop. But Brenda´s isn´t your ordinary pet shop. Turner gives it a personal touch. "I want to match the right bird to the right person, or family. For instance, a couple with children would do much better with a cockatiel than anything else," he said. "And if a person´s personality isn´t that of a bird owner, than I tell them that, too. I don´t want to sell anyone the wrong bird, or the wrong pet." Turner, who runs the store now that Brenda´s has a family to look after, also makes and sells his own perches, waling canes and bird feeders. He´s built his own pond out front, which currently serves as a home to a variety of birds as well as a rescued duck and turtle. Rescuing birds is another aspect of Turner´s business. On any given week he receives at least one phone call asking for help in rescuing a bird. "Whenever an injured bird is found we get called to come and get it," said the grandfather of 13. "FPL calls us whenever they need to get birds out of nests form the transformers." That care is one of the reasons Briganti thinks her dad´s store stands above the rest. "How many other bird stores can you walk in with a bird who has an egg stuck inside them and the owner will take the bird in the back, soak it in hot water and carefully remove the egg? I´ve seen him do it countless times." The store, which also makes and bags its own bird food, releases all birds that have brought in from the wild, but also breeds its own. Even Turner´s garage at home is dedicated to his bird passion. "Baby birds are so incredible. Waiting to see what color they are going to be is the best part about it," he said. "But they need to be fed every few hours, so we can´t keep them in the store. My garage is their nursery. Right now we have about 45 babies." As for his favorite bird, Turner chooses the Quaker. "It´s got such a fun personality," he said. "It´s rough, tough and indestructible. It flies around completely free. Bob Turner owns Brenda´s Birds in Delray Beach: The shop, at 324 N.E. 3rd Ave., opened about 10 years ago. Turner offers boarding services and frequently takes in birds that are sick or injured and nurses them back to health. 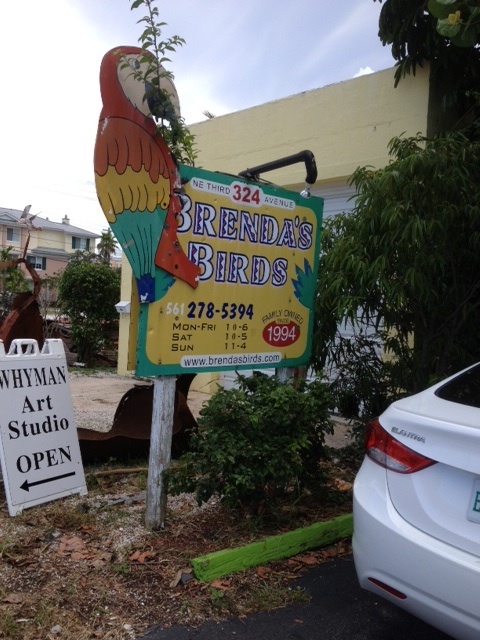 Drive up Northeast Third Avenue in Delray Beach and it´s easy to slip past Brenda´s Birds without a second notice. Oh sure, you might hear a bit of chirping coming from behind the wall, you might even hear the call of a peacock or the occasional crow of a rooster. But it is not until you open the gate and walk in that you realize this truly is a hidden jewel within Delray Beach. With about 1,000 birds of varying sizes ans species, Brenda´s Birds is a unique family owned and operated business with a 20-year proven track record and customers who come from as far away as Miami and Martin county. "This business is strictly for the birds," says owner Bob Turner, who runs the business - named after his daughter Brenda - along with this wife Rosemary. In fact, Brenda´s Birds is actually several businesses rolled into one. A large percentage of the business, of course, is the sale of birds ranging from parakeets and cockatiels to more exotic birds such as macaws, parrots, and Japanese and silver pheasants. At Brenda´s Birds, you´ll also find a wide selection of finches and lovebirds, and there are several kinds of pigeons and doves, including white doves used in weddings and for other special occasions. While some of the birds at Brenda´s come from breeders when they´re very young, many are actually born at the 6,000 square feet facility, which includes a "baby room" for young birds and an incubator where eggs are kept until they hatch. For people who already have birds, Brenda´s offers boarding and grooming, with much of the work done by Turner himself. You´ll also find a large selection of cages and perches, many made right in the back shop. And of course, Brenda´s is the place to go if you´re looking for food that´s right for your bird. Turner will tell you that you can´t be in the business - which requires a lot of work, including store hours seven days a week - without having a passion for birds. That passion has led Turner to take in injured birds over the years and to help them recover and return to their natural habitat. "Over 20 years, I must have "rehabbed" about 500 birds," he said. During those years, Bob and Rosemary have become experts on birds and that expertise is passed on to customers. "We´ve raised just every bird we have and we can tell you how best to take care of them," Turner says. "We´re always glad to offer the best advice about what bird is right for each situation." To Parrot Fanciers, they´re known as Quaker parakeets (Myiopsitta monachus).In the wild, more often than not, they*re called monk parakeets. Whatever the name, their species is the only parrot to build freestanding nests out of sticks and other materials. Other parrots build nests, but house them in tree cavities or other non-freestanding locations; these nests are only used for breeding purposes and are abandoned after the young have fledged. Quaker nests are big, complex structures that typically host more than one family, with each family having its own "apartment" and entrance. They live in these nests year round, another distinctive trait of their species. Quakers choose high, safe locations to build their huge, twiggy homes. Sometimes they make them at the tops of palm trees or, less conveniently for their human neighbors, the tops of utility poles, frequently right next to the transformers that carry electricity. However it began, Florida´s feral Quaker population has become well-established throughout the state and there are other feral flocks in locations throughout the United States. The largest populations live in the warm climates of Florida and Texas, but they also occupy colder areas like Chicago, Illinois, and Brooklyn, New York. Because Quakers are communal dwellers, their nest-size grows as more birds join the flock. Eventually, what began as a reasonably sized pile of sticks can grow into an enormous structure. These structures present a hazard and can interfere with the proper operation of the electrical equipment on an electricity pole. To prevent this from happening, the local electric utility company in Florida calls out crews to remove the nests when they overgrow the safety margin. Campagna waded through the bureaucracy of the utility company, attempting to locate someone with the authority to enact a process protecting the young Quakers during nest removals. "I eventually located a department that works with environmental groups to protect endangered native wildlife that is impacted by utilities, "she explained. "Although they were initially hesitant to work with nonnative species, such as the Quaker, they bowed to the more important issue of protecting defenseless creatures and agreed to help." They agreed to contact a list of volunteers the day before a scheduled Quaker nest tear down. The volunteers would have the opportunity to organize local resources to participate at the nest site and accept the displaced babies and eggs. Campagna recognized this as a major concession on the part of the utility company and as a first step toward rescuing the babies. The next step was to explain the situation to the nearly 400 members of the Quaker Parakeet Mailing List. With just one posting to the group a list was generated. The posting asked for volunteers in various Florida counties willing to be responsible for prearranging breeders and wildlife care centers to accept and raise the displaced young Quaker. The response from the mailing list was overwhelming. Campagna easily signed up volunteer contacts for the key areas in Florida where Quaker are numerous. Some members expressed sorrow at not being able to cover an area because they lived across the country. The volunteer list was forwarded to the utility company, where it has been put to good use. The first time Campagna´s list we used was during a nest tear down in April 1999. Bruce "Doc" Wolfson, who lives in Miami´s fashionable South Beach, had only been involved with Quaker for about a year. Wolfson had hand-fed his own bird sine it was just a few weeks old, and he knew how vulnerable the tiny babies were. Wolfson was a natural to take on the rescue project. "I said I would try, " states Wolfson. "I wondered what I had gotten myself into. I had only one experience with hand-feeding." It was a terrifying process that he did not know much about, yet he had been placed in charges of the rescue of innumerable chicks and eggs. Like the people from the utility company, he felt it was the only humane thing to do. After speaking to people he knew, Wolfson figured ha had Dade County covered for the majority of what might happen. "I had two breeders involved who said they would help -- one at either end of Dade County. I also looked for a vet but did not have any luck there. Broward County, on the other hand, was on a back burner until later." After an initial burst of activity setting up his crew, there was no contact from the utility company. What Wolfson describes as "a feeling of complacency" set in. "I didn´t call anyone I thought I might have to, figuring I would go see them instead. But nothing happened, and there was no progress on my end. Of course, life did not go according to his assumption. One Friday, a call came in form he utility company stating that they would be moving two nest in neighboring Broward County on the following Monday. They provided the address and the time -- 9:00 a.m., sharp. Wolfson´s arrangements had to be coordinated over the weekend. Calling around, Wolfson spoke to The Wildlife Care Center in Fort Lauderdale, who promised to have an on-site ambulance standing by. "Perfect!" he thought , but while shopping later in the day , he bought a picnic basket (just like the one he used to transport his own bird) just in case there were problems with the ambulance. On Sunday, Wolfson and his godson traveled 30 miles from Miami to the nest site to check things out. Neither nest looked big, but because of the time of year, both probably had chicks and/or eggs. The nests were on transformers and neither showed much activity. On Monday, the day of the removal, Wolfson´s job took him to an area close to the nests. Arriving at 8:30 a.m., he found that the nests were active, appearing to have three to four birds in each. At 9:00 a.m., a truck from the utility company arrived and Fran, a retired utility company worker now working under contract for an environmental services company, introduced himself. He gave Wolfson a short course on how transformers (actually storage batteries meant to help keep a constant power output and prevent unmanageable power surges) work, as well as how feral Quaker interrupt the function of the transformers. Fran then gave a short explanation of what was about to happen. A second truck, a cherry picker,, arrived shortly thereafter, driven by Terry, who also worked for the environmental company. Both men were quickly in safety harnesses and busy taking down the nest. The first nest yielded seven eggs, including tow with holes in them. While this was taking place, Wolfson noted that the ambulance he had promised was not there. After many frantice calls, he discoverd the wildlife center had another emergency and was trying to find a nearby volunteer to cover the nest tear down. Meanwhile, Wolfson put the piece of nest with the eggs in the back of his truck while the utility company´s workers went back for the second nest. "this nest had four babies, I think, " Wolfson said, admitting how shaken he was by the experience. "There was still no ambulance. The utility guys were as gentle as you can imagine -- they treated the babies like they were thier own. After the nest was torn down, the parent Quaker were visibly upset. Wolfson continued, "Fran was on the ground. Terry was cleaning up the nest part and sticks, and putting them in a bag for disposal. It was sad. The Quaker on the eggs and chicks waited until the guy was within arm´s reach before going out the back of the nest. With no ambulance or brooder nearby, Wolfson put the eggs and babies into the carrier he had bought. Lined with paper, the tiny nestlings and the eggs were whisked off the The Wildlife Care Center in Fort Lauderdale, where the babies were fed and placed with foster avian parents. Wolfson met and thanked the director, then dashed off to work. The total time spent on the rescue was three hours. The following Tuesday, Wolfson recieved another call about a nest tear-down in the same area that would take place on Thursday. The wildlife center although interested, had their hands full caring tor native species. Understandably, they were unable to strain their limited resources, but hey gave Wolfson names of other that could help. He said that the wildlife center´s people were a great help and a wonderful resource for getting the job done. Other volunteers required specific times in advance in order to coordinate their schedules. This was largely impractical, given the random way the nest are removed. Happily though, Campaign who Wolfson calls "the angel" of the story, referred him to Bob Turner, of Brenda´s Birds in Delray. Turner was the breeder who originally brought the problem of the nest removals to Karen´s attention. Turner assured Wolfson tha he would be the to help with the babies anytime and anywhere. Thursday arrived. Wolfson took a sick day from work. The nest-removal crew arrived. Turner arrived with a brooder and an incubator in his truck. The nests came down. This time, however, there were more than 25 babies, ranging from 2 days to a week old. There were also 15 eggs. Turner placed them in their protective transports and whisked them off to their new temporary home. Wolfson thanked the Quaker Mailing List for "moral support and ideas that were greatly appreciated." Most of all, he was thrilled "to get to see a bunch of our "little green chickens" not become part of the food chain. "If this story moves anyone to ant ot help in some way, " he concluded, " I would suggest a donation to The Wildlife Care Center in Fort Lauderdale. The have Quaker there, and they really go out of there way to make sure they are getting good homes before they let them go. This includes home visits from an adoption counselor." The center is located at 3200 SW 4th Avenue, Fort Lauderdale, Florida 33315. Campagna refers to Wolfson as her "hero." He was able to pull together the necessary components to make the rescue happen, even though he felt completely unequipped to handle the job. Campagna believes that the feral monk dilemma is not going to be easily solved. She says, "The Florida Audubon Society has not commissioned a consultant researcher to do a census of Quaker nests, as a first step to understanding the impact the South American parrot has on our ecological space. "While Audubon´s usual position on non-native species is generally not favorable; the jury is still out with regards to the Quaker. No empirical evidence has been gathered to refute the notion that Quaker have peacefully found their niche in our ecological chain. Until such evidence is found, if ever it is, I believe quakers deserve the same protection afforded our native creatures. The list of Quaker rescue volunteers working with the utility company is a step in that direction. SPUNKY, SWEET, AND LOVABLE...THESE ARE JUST A FEW OF THE MANY WORDS THAT DESCRIBE THESE FEATHERED CREATURES. COCKATIELS MAKE GREAT PETS AND FRIENDS WHEN TAKEN CARE OF CORRECTLY. I WILL TELL YOU EVERYTHING YOU NEED TO KNOW FROM THE RIGHT WAY TO PURCHASE A BIRD TO THE BEST DIET TO GETTING YOUR FEATHERED FRIEND TO TALK! READ ALONG AND YOU TOO WILL BE CRAZY FOR COCKATIELS! Brenda's Birds-The Best Place to Buy Cockatiels in South Florida. Now that you are ready to buy your cockatiel and know what signs indicate a healthy bird, it is time to pick the right place to purchase your cockatiel. It is very important to buy from a store or breeder that shows genuine concern for birds; conditions should be clean, food and water should be provided, and the cages should be of sufficient size for the birds and should not be overcrowded. I have found the most awesome bird store EVER in South Florida: Brenda's Birds. They really take excellent care of their birds. Going there is such a fun experience and anytime my boyfriend and I go we spend at least an hour there checking out the different species. Upon pulling into the parking lot you are immediately greeted by the sound of birds chirping and singing. There is a giant rain tree covering the outdoor section, which includes a small pond. This is where they keep the cockatiels, love birds, parakeets, chickens, doves, quakerparrots, and one white peacock. This outdoor style of caging allows the birds to feel as though they are in their natural habitat. The cages are of perfect size and are not overcrowded. The white peacock and some of the chickens wander the enclosure freely. Moving under part of the building, but still outside is where the macaws and cockatoos are kept. Once inside there are small cages for baby birds, a plethora of toys, food, and perches. There are many species of finches in the long corridor (Ryan and I bought our two gouldian finches here). Then there is the area where they keep the birds that are boarding. Me petting the sweetest little Cockatoo; she was boarding. A Macaw in his very large enclosure. Brenda's Birds is owned by Bob Turner and his daughter, Brenda. Both have always had a passion for birds. Brenda's Birds has been featured in the popular magazine, "BIRDTALK." It is an extremely reputable store and they take great care of the birds. Bob takes caring for the birds very seriously. "I want to match the right bird to the right person, or family. For instance, a couple with children would do much better with a cockatiel than anything else," Bob said. "And if a person's personality isn't that of a bird owner, than I tell them that, too. I don't want to sell anyone the wrong bird." This cage is perfect for cockatiels; very well lit and not too crowded. Brenda's Birds is family owned and was opened in 1994. I found Loki, but if I were ever to buy another cockatiel I would go to Brenda's Birds. Even if you are not interested in purchasing a bird you should still go check this place out...its that great! Brenda's Birds is located in Delray Beach at 324 N.E. 3rd Ave.
Whoever said hobbies are for the birds must have known Brenda McBrinn. For eight years, she bred and sold birds out of her Delray Beach home. But four years ago, she realized her hobby had gotten out of control. So she moved into a 9,000-square-foot store about four miles from her home and called it Brenda's Birds. Today, she has about 500 birds, including more than 60 species ranging from finches and canaries to Amazon and African grey parrots. But this is not your typical pet shop. ``It's more like a petting zoo,'' McBrinn said. McBrinn is so anxious to have customers hold the birds (human contact tames them, she says), that she is happy if people just come in to play. And don't be surprised if you find groups of schoolchildren getting a grand tour of the store and learning everything they ever wanted to know about these fine-feathered friends, including how to feed the babieswith a syringe. About five times a year, McBrinn takes her bird show (a nest box with an egg, a baby bird and an adult bird) to schools and libraries to teach children how birds develop. McBrinn said her primary goal is to make sure her birds find a good home. If people can't afford the bird they fall in love with, McBrinn will try to work something out. in trade for a blue and gold macaw. She's not even sure what kind of fish it is, and she's been trying to sell it for two years. Still, she doesn't regret her decision. Sometimes, customers drop in just to say hello to McBrinn and Bob and Rosemary Turner, McBrinn's parents, who work in the store. Customer Tom Antol of Delray Beach is one of McBrinn's biggest fans. ``Animal lovers like to be around other animal lovers,'' he said. This past Christmas, Caroline Ackinclose of Delray Beach stopped by with some homemade gingerbread cookies. Most of Ackinclose's 60 birds were purchased from Brenda's Birds. Brenda's Birds Inc. is at 324 NE Third Ave., Delray Beach. The phone number is 561-278-5394. It’s been a rather dull week of walking. Utilitarian laps around the neighborhood, swinging by the recycling bins, doing double laps around the apartment complex. Tuesday through Thursday I worked eight hour days at a temp job in Boca, a forty minute commute each way. It’s hard to then drive to the beach for a walk, the beach parking situation being what it is here in Boynton. Thursday was my Friday this week. My husband and I decided to meet at a happy hour we heard about at The Coffee District in Delray. It’s in Pineapple Grove, an up and coming artist’s neighborhood. We had stopped there for coffee before we left for Miami and couldn’t help but notice the large selection of craft beers, bottled and on tap. I arrived well before my husband so took a walk along a back alley that felt like I had left the upscale hustle and bustle of downtown Delray Beach miles behind. It was old Florida, 1950’s style motels turned into apartments with overgrown plants, music blasting from open windows, and dogs chained to fences, barking as I passed by. Enticing street art pulled me further into the neighborhood called Artists Alley. I had stumbled upon Jeff Whyman’s Gallery. The squawking of various birds drew me further down the street to a ramshackle aviary where a lone rooster roamed the parking lot. Tall cages towered above a fence, but I couldn’t really tell what was going on in there. I circled around to the front of the building, discovering I had found a place called Brenda’s Birds. It was five o’clock. The sign said “Public Welcome 10-6”. I should have gone in and checked it out. Later that evening, while we were talking to the bartenders and some locals back at the Coffee District, I asked about the place, and they told me Brenda ships macaws, cockatoos, parrots, and other exotic birds all over the world. “You should have checked it out,” they told me. But this is the thing. I am petrified of birds flying at me. When I was young, my brother desperately wanted a dog. My parents were dead set against a dog. My brother persisted, working his way up from fish in an aquarium to parakeets. The first bird was named Friar. My father was an alumni of Providence College and a huge fan of the P.C. Friars basketball team. He went to all the home games, taking us along sometimes. Grateful for any kind of pet, my brother named the parakeet Friar, after my father’s favorite team. After closing the doors to our dining room, he would let Friar out of his cage and the little blue and yellow bird would dive bomb through the room, scaring the hell out of me and sending me cowering under the dining room table. Friar flew free for nine months until he slammed into the etched glass door, broke a wing, and lasted only a few days after the accident. My brother made another pitch for a dog but my parents got another parakeet. This one was named Yaz, after Carl Yastrzemski of the Boston Red Sox. He only lasted a couple of weeks, arriving at our house already sick. He didn’t eat much and quickly withered away. My parents finally gave in and we got Dewey, a black lab. My brother gave up on the sports related names and christened the dog after Dewey Bunnell, the lead singer in the band America. My father thought this was a silly name for a dog, so when he registered him with the town, he wrote his name as Admiral Dewey, best known for his victory at the Battle of Manila Bay during the Spanish-American War. But that was something only my father would know. I just this minute looked it up on Wikipedia. Admiral Dewey remained with my parents long after we had all grown up and moved out of the house and they were heartbroken when he passed away. Sometimes what you don’t want is really what you wanted all along. So take a walk, get the creative juices flowing. You never know what you might find. Street art, exotic birds, a trip down memory lane. You never know where you might find a story. 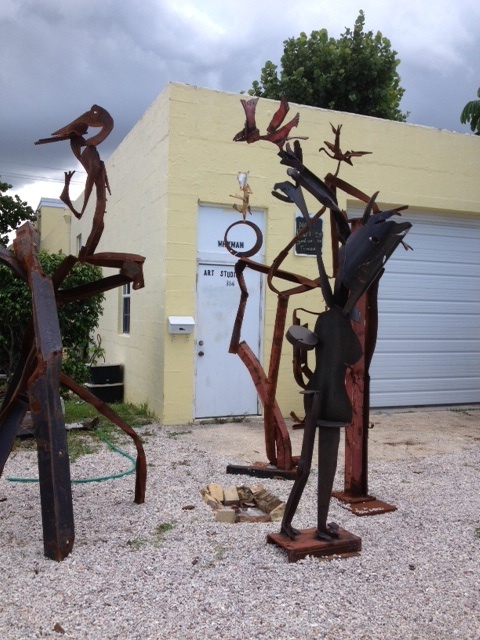 And if you’re in Delray, definitely stop by the Coffee District, Brenda’s Birds and Jeff Whyman’s studio.